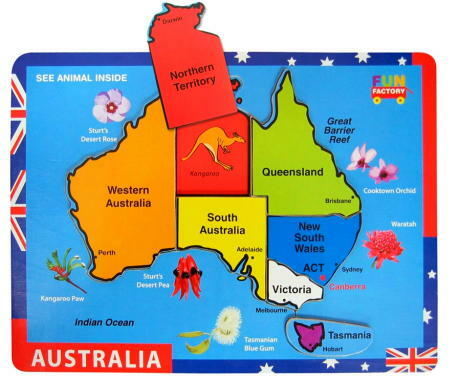 Australia Map Chunky Piece Puzzle is a solid seven piece puzzle in striking colours with each piece depicting a state of Australia. This simple puzzle is marked with each states name and capital and is surrounded by wildflowers from each state. When the pieces are removed they reveal an animal which is associated with that area. A great learning tool this chunky has nice solid large pieces. Size: 30cm x 23cm. Puzzle pieces are 1cm thick. Material: Wood, Child-Safe paint, Wipe clean shiny paper surface. We like this because: "Many learning opportunities with this puzzle. " Hi Douglas,Thank you so much for such great communication. I have another order with a different Aussie company and I've had to chase them repeatedly after having placed the order 6 weeks ago....Thanks again, I hope I can do business with you again in the future.